After years spent living on the run, Samuel Hawley moves with his teenage daughter, Loo, to Olympus, Massachusetts. There, in his late wife’s hometown, Hawley finds work as a fisherman, while Loo struggles to fit in at school and grows curious about her mother’s mysterious death. Haunting them both are twelve scars Hawley carries on his body, from twelve bullets in his criminal past; the past that eventually spills over into his daughter’s present until together they must face a reckoning yet to come. This father-daughter epic weaves back and forth through time and across America, from Alaska to the Adirondacks. As someone who grew up the next town over from Salem (Peabody), I am always very interested when novels featuring The North Shore are written. I am always a little critical because of the author, usually not from the area, only focuses on Salem or Gloucester and what they are most known for Halloween (Salem) and fishing (Gloucester). It always irks me to read those books because the stereotypes scream from the books. The girl whose ancestors come from Salem and she finds out she has powers (Salem) or the fisherman who battles nature to get the big haul (Gloucester). Usually, I can’t get through the book, I have to DNF it because I want to gag. 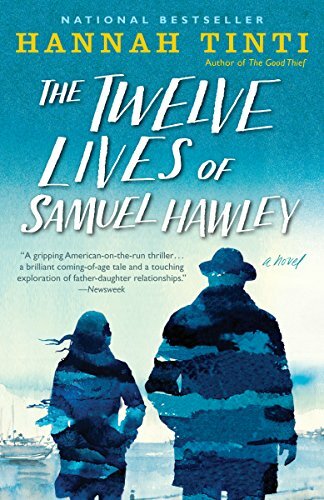 Happily, though, The Twelve Lives of Samuel Hawley doesn’t have any of those stereotypes and that itself is refreshing. Also, the author herself is from Salem, so she knows the areas from Rockport to Lynn probably as well I do and that added just that extra touch of authenticity to her book. I actually had to go to google Olympus and Dogtown. Just to make sure that Olympus isn’t there. Massachusetts is famous for having small towns that you can drive through and miss. Take Hathrone. It is a tiny town between Danvers and Middleton. When I say small, it is teeny. I think that it is actually considered part of Danvers but it has its own zip code and post office. I didn’t know it existed until about 15 years ago….when the guy I was dating actually told me about it….lol. So, googling Olympus to check it out became my main goal. Dogtown, I googled too even though I knew it was real. I kinda felt bad for Loo at the beginning of the book. She moved around a ton and had a father that kept major secrets from her. Saying that the moving around didn’t affect her would be lying. When they settled down in Olympus, things got really bad for her. I am glad that the author had Loo react the way she did to bullying. It was real. Nothing was hunky dory after the rock in the sock incident but the kids left her alone. And her anger issues after that. Oh Lordy, she needed anger management classes, therapy or both. Even with her kinda boyfriend, Marshall Titus, she was mean. Put it this way, Loo wasn’t a nice person by the end of the book, even though she tried to be one. While Loo’s story wasn’t easy to read, Hawley’s story was even worse. The author chose to tell his story by each bullet wound that he got (12 in all). Hawley was not a good man….far from it. But he did try to turn himself around when he married Lily (Loo’s mother) and then they had Loo. But his past criminal life kept sucking him in and it eventually cost him everything. I could see why he was hiding it from Loo. He was protecting her but still. He should have left well enough alone (read the book if you want to know what I meant by that). Hawley’s story and Loo’s story was seamlessly brought together towards the end of the book. The events that happened at the end of the book did leave it up in the air. You don’t know if there will be a HEA or what. That was pretty refreshing. I can see people complaining about it, though, saying that all books need clear-cut endings. But with this book, nothing was clear-cut so why should the end be? Why: An engrossing book that kept me turning the pages until well after my bedtime. The characters were very complex and their relationships with each other and other characters were complex too. This is not an easy read, so be warned. I liked it because it was different from what I usually read and like I said above, the characters were complex. Why: Violence, language and some sexual situations.